At the Geowise InstantAtlas (IAS) workshop in Nottingham, more than 70 public sector IAS users shared experiences and suggestions over how their systems were helping support local decisions and services. Less national (and regional) infrastructure and support for local decision-making, e.g. disappearing Data Hub, Places Analysis Toolkit, Floor Targets, State of the Cities, Regional ONS statisticians and Local Improvement Advisors. ONS hit by 10% per year budget cuts, CLG even more. Value of local information systems and local intelligence = influence on local actions and decisions. Delegates then hotly debated two questions: What has been done in your area (with your LIS) to influence decisions and actions? And what would you like to do that would give most value to your communities? 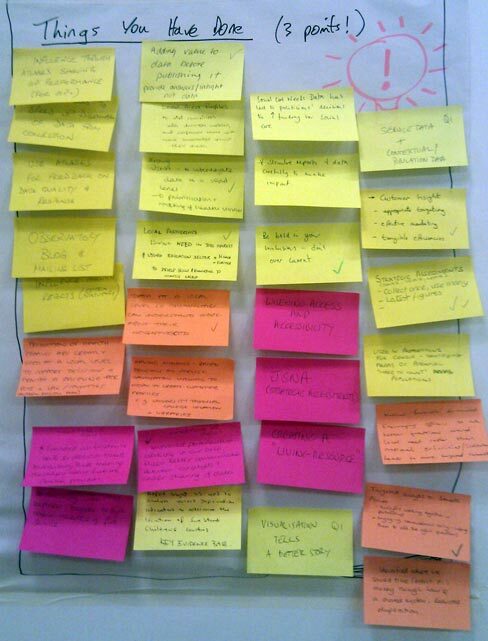 Some important themes were highlighted, with the Work Boards (see photo) full of suggestions on how LIS can support local working. Many users and case studies highlighted the growing role of local information systems as the first port of call for public sector, providers (both 3rd sector and commercial), local communities and citizens looking for information on the local area. Users saw this role as increasing in importance with the disappearance of national systems such as the CLG Places Analysis Toolkit and Floor Targets – and there was speculation over the future of Neighbourhood Statistics given ONS budget cuts. As well as the efficiency in providing a one-stop-shop for local information – reducing duplication across agencies – users also quoted the “collect once, use many times” mantra. There were real savings in areas where LIS were used to quickly bring together “Data Appendices” for a range of needs assessments, such as the health and social care Joint Strategic Needs Assessment (JSNA), Local Economic Assessment (LEA) and the community safety Joint Strategic Intelligence Assessment (JSIA). Local analysts were then freed-up to focus on adding-value to local data, and understanding and interpreting the key local messages (rather than spending time developing and reporting the routine datasets for these assessments). Finally, LIS were seen as a key resource in getting evidence and analysis quickly to users – rather than waiting for lengthy reports to be written and published. The InstantAtlas templates were being used as a standard way to disseminate information to different local groups, such as performance data for GPs and results from local surveys and other data collection. “… good decisions depend on the skills and knowledge of those who have been empowered”, Kirsteen Thomson (Sustainable Communities Excellence Network). Unsurprisingly, many flagged-up the importance of providing data for communities, and making it available over time to understand trends. However, it was noticeable that the discussions quickly moved onto the need for knowledge and data for specific groups and particular decisions – rather than a general call for “raw data now”. Many of the examples for how the LIS had influenced actions and decisions were about local hot topics, such as providing evidence to help locate Sure Start centres, health services and new technical college provision, and helping decide how resources were spent on social care services. And some LIS teams were providing external training to the community and voluntary sectors as well as other public agencies such as Fire and Rescue services, in using the LIS and the information held. Regular mail-outs, and “how-to-use” materials such as videos, were also identified as good ways of helping different groups make best use of the information in the LIS. Those with advanced computer skills and knowledge of official statistics such as researchers who are already using data (nicknamed ‘Carys’). There were also many examples from other LIS teams around the importance of analysing and interpreting the data. Summary reports, analysis and profiles add value for those users less familiar with the data were seen as important in engaging and informing users from the community and voluntary sectors. Suggestions on how to maximize impact of analysis included data visualisations and “bold conclusions”. However, the raw data is still needed for ‘power users’ such as researchers (who may want access to a much wider set of data than practical to include in reports). Theme What has been done in your area (with your LIS) to influence decisions and actions? What would you like to do that would give most value to your communities? Engaging and informing different types of users Make sure we are thinking about our different types of user – with photos and names! OCSI develop and interpret the evidence base to help the public sector and other organisations deliver better services to the public. We are committed to improving social and economic outcomes by providing high quality rigorous research and analysis that meets the needs of our users. Since launching in 2003, OCSI have worked with more than 90 public and voluntary sector agencies at local, regional and national level to improve policy-making and service delivery. We are a “spin-out” research consultancy from the Oxford University team behind the Index of Multiple Deprivation. See the OCSI website www.ocsi.co.uk for more.